Character. Coste: 6. FUE: 4. "Fear is what keeps a man alive in this world of treachery and deceit." 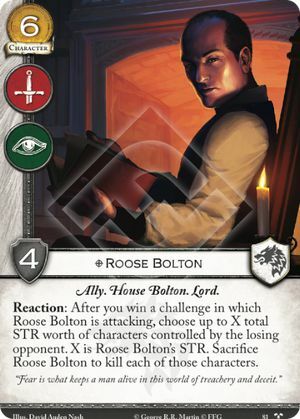 Note that Roose's ability checks his current STR, not his printed STR, so all buffs from Winterfell, Needle, etc. apply.